Cast iron composition that provides better performance of cast elements of chains, and can replace high-alloy steel has been developed. It is shown that cast joints of chains made of experimental iron with 2.34% C, 20.4% Cr and 0.38% Al have higher wear resistance as compared with X18H10T steel at 750…800°C. Key words: chain joints, wear resistance, high-temperature resistance, thermal stresses, cast iron, steel. Investigation into the effect of the modifying multi-component mixture showed a substantial reduction in casting porosity and rejects related to blisters and surface cracks. Key words: melt, crystallization centers, amount of porosity, gas saturation. A method of melt treatment to improve cupola iron properties for making grinding bodies – balls and cylpebs – has been developed. This method being realized in duplex process makes it possible to increase hardness, impact resistance, strength characteristics and wear resistance of non-alloyed iron, and to minimize iron casting defects. Key words: cupola iron, melt treatment, inoculation, nitriding, carburizing, grinding balls, cylpebs, hardness, strength, impact resistance. It is conducted the comparative analysis of structure, mechanical properties and crackresistance of casts from heatproof nickel alloys, got in the process of the directed and equalexes crystallization. Keywords: heatproof nickel alloy, cast, directed crystallization, macrostructure, mechanical properties, crackresistance. The work is dedicated to investigating the results of inoculating AlSi7Mg alloy with nanopowder TiN and AlN inoculants. Significant effect of these additives on the grain refinement, increase in microhardness and plasticity of castings is shown. Key words: inoculation, nanopowders, structure, melt, refinement. The structure of hardeners on the basis of acetates etylenglycol (АCЕG) with use as additives EG, ТEОS, ES-40 and their influence on properties of is cold hardening mixes is resulted. Keywords: monoacetates etylenglycol, diacetates etylenglycol, tetroetocsisilane, etylsilicate, etylenglycol. One of the major problems occurring in the production of molds and cores based on sodium silicate is the more difficult sand knockout from castings, which is solved by introducing in the sodium silicate composition various additives, most of which are, however, not universal. To lower the sodium silicate amount in the sand to 3…4%, without decreasing the strength after hardening, it was decided to investigate a sodium salt of carboxymethylcellulose (S-CMC) as a modifier. Key words: binder composition, sodium silicate, knockout capability, hardening, strength. The article discusses a method of identification that allows finding process areas where parameter violations occurred, identifying causes of such violations, and suggesting methods of their correction. Key words: identifier, violation, process, factor, parameter. The character of deformations in shell mold layers during drying, and influence of mold porosity on its stressedly-deformed state were investigated. It was found that use of porous polymer models, due to their hydrophobic property, reduces deformations during production in the structure of a conventional three-layer shell mold by 10…14% as compared to the conventional porous pattern. 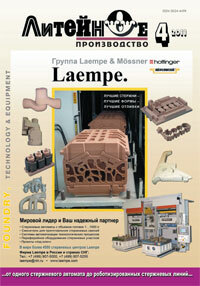 Key words: porous pattern, shell mold, stressed state, structure, layer. Possibilities of influencing the process of structure and properties formation in magnetic mold (MM) casting using lost foam patterns, in particular, by blowing the MM during the solidification of iron casting were investigated. A mathematical model of the process with a number of assumptions was obtained. Key words: magnetic mold, shot, gas blowing, hydrodynamic resistance, pores, thermal destruction.